The Cornfather’s back! It hasn’t been that long since the last time we saw him, but it feels like I haven’t drawn him in ages. As much as I loved drawing cel in the previous storyline, it was kind of nice to get back to drawing jefbot and the Cornfather, up to their old shenanigans once again. Consider this one an epilogue to the cel Saga. As soon as I saw the name of this strip, it made me think of the SNL skit, Lazy Sunday. “But first my hunger pains are stickin’ like duct tape. I love those cupcakes like McAdams loves Gosling!” and the middle panel had me laughing so hard. Between the red background (Kinda Kill Bill-ish) to everyone’s expression in that panel was priceless! (Especially Abraxas’!) Another awesome strip! Meep! Perfect strip. I imagine Cornfathers terrified screech reaching untold pitches, much higher a note than a man normally ought to be able to make. Dogs perk their ears in curiosity even several blocks over. you’d be right about the Cornfather’s scream there, Jed; in addition to alarming animals, it’ll crack any crystal in the near vicinity. I hate to be a grammar Nazi but it’s hunger pangs.. Great strip anyway. Poor Cornfather. ha! i promise, there’ll be less paint in the next strip, Vee! Really funny, bot. Who knew you could throw some “horror” into your comic strip? 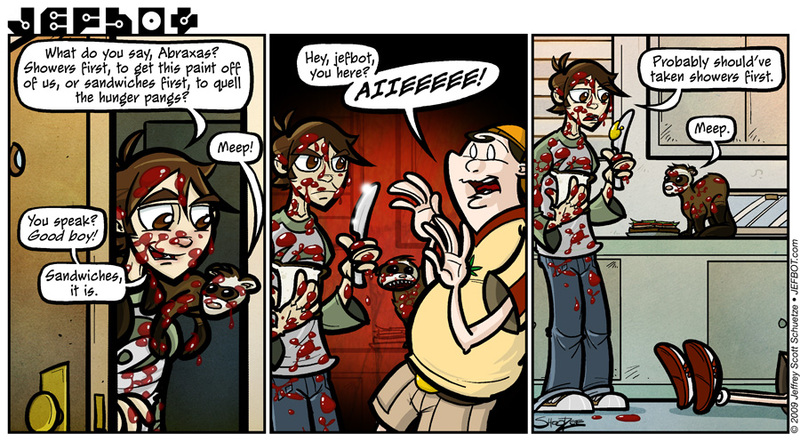 I love how the red paint has lived through all these strips just so you could get to this punchline. The colors in this one are awesome and Abraxas looks so adorable in it but not as adorable as the knife. 😉 Great work, brother! I LOVE the shine in the knife! Excellent job as always Jefbot! I love your eyes in that frame too! Rock on Jefbot! Take the sandwiches, leave the paint. i agree, Mary – i’m hungry now! I would have said showers first. You would hate to get paint in the sandwich. Jeff Shootzee stars in: Yes! You *ARE* Chopped Liver! spanky is right…abraxas really look like terrifying…lol…..
awww, i *really* appreciate that, RinaRaiinbowlicious! reading through the archives is no small task either, now that there are almost 150 strips in there. glad to have you on board and thanks for the comment! I think everybody else has said it. Great strip Bot. I loved the eyes, the knife and the way abraxas looks in the second panel, all with his teeth out and everything. That middle panel made really made me LOL while I’m suppose to be working. Keep em up! awesome, Tystarr! reading JEFbot while you’re supposed to be working is *always* approved of. yeah, Abraxas is all cute at the moment, but never forget his origins, JF3!!! and i think my office-mates think i’m crazy too, so welcome to the club! i think going a little crazy at work is the only way to stay sane.